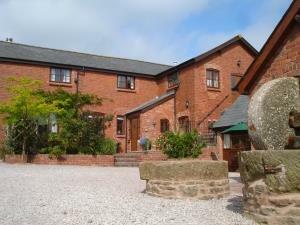 Penylan Farm01600 716435work01600 719391fax Bed & BreakfastThe perfect relaxing country holiday at our converted oak beamed granary set in its own courtyard on a working farm. Breakfasts focus on local produce as much as possible with free range eggs from the farm when available and fresh apple juice from a farm nearby. Skirted either side by the Wye Valley and Black Mountains, Penylan (top of the hill) is situated in the Parish of Llangattock-vibon-Avel and was originally part of the historic Hendre Estate which was owned by the Rolls family. A view can be seen of the upper part of the famous Rolls of Monmouth Golf course, named after Charles Stewart Rolls (co-founder of Rolls Royce). Many walks nearby with the Three Castles Walk 1.5miles away (linking the Norman castles of Skenfrith, Whitecastle and Grosmont), Offa's Dyke 1.5miles away. Wye Valley Walk and Monnow Valley Walk closeby and Brecon Beacons a short drive away. Why not stay at home and try out our 'Rolls Circuit' - our individually designed 5 mile walk taking in the beauty and history of the area surrounding the farm. Other outdoor activities include cycling and walking in Royal Forest of Dean, canoeing on River Wye, rock climbing and abseiling at Symonds Yat and canal trips with daily boat hire - all within 12 miles. Hereford is 17 miles away with beautiful cathedral and famous Mappa Mundi, one of the oldest maps in the world. The perfect relaxing country holiday at our converted oak beamed granary set in its own courtyard on a working farm. Central for Chepstow, Hereford and Cheltenham racecourses. Take B4233 from Monmouth towards Rockfield/Abergavenny. This will take you round roundabout near the old gatehouse bridge and straight over three mini roundabouts (bearing right). Bear left in the village of Rockfield (approx. 2 miles from Monmouth). Carry on the B4233 towards The Hendre. Before dropping down into The Hendre, take a right turn to Newcastle (just past a white bungalow on right). Follow road for approximately 1- 2 miles.